Ah, yes… the rock climb! He was extremely skeptical of this scaffolding technique, but was happy we saved quite a few bucks in trying (and succeeding at) it! Oh man…I just felt my stomach drop a little looking at that last pic :) Impressive set up! Ok, looks good if you’re, like, 110. I’m a P&D in the UK & have used this technique for years . The theory is fine but your plank is far too narrow . I would use a standard scaff plank which is about a foot wide… and you can sweet-talk some local builders into lending you one. Jane, thanks for the tip! Not being in the industry, I hadn’t heard of such a thing. If ever I need to repaint the high spots, I’ll be sure to hunt down a scarf plank! This method is fine, but your plank seems inadequate. Jamie – thanks so much for your recommendation! I had tried looking for a calculator when I attempted this method and couldn’t find one. Really appreciate your links and advice. It looks like I’ll be paying the $30 an hour. 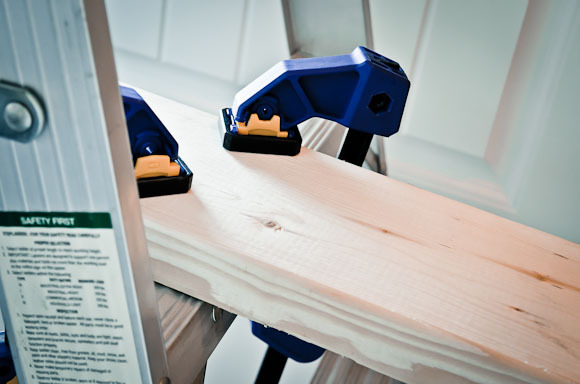 You have done a great job in this post because you have provided us how to deal with stairwell. I really thankful for you and your blog. Thanks for sharing this.